Whether you need a shuttle to RDU... Or want to learn about CLT, PTI, RDU or other North Carolina airports, you'll find it here. Raleigh–Durham International Airport (RDU) is the main airport serving Raleigh, North Carolina, Durham, North Carolina and surrounding Research Triangle Park area(s) of North Carolina. The airport is located approximately 4.5 miles northeast of the Town of Morrisville in Wake County, and approximately 1 mile from the northern boundary of Raleigh also in Wake County. The airport covers 4,929 acres, and has three (3) runways. Currently, RDU Airport offers direct flights to 38 domestic and international cities on approximately 352 daily flights. In 2011, more than 9 million passengers traveled through RDU Airport. The RDU Airport Authority is in charge of the airport facilities and its operations. The RDU Airport Authority is controlled by a board of representatives from Wake County and Durham County, as well as the cities of Raleigh and Durham. 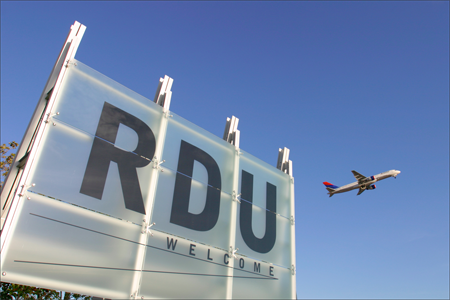 To learn more about RDU Airport, click here. Piedmont Triad International Airport (PTI) is part of a 4,000-acre campus, home to more than 50 companies that infuse an estimated $1 billion into the local community annually. More than 4,000 people work on the campus. 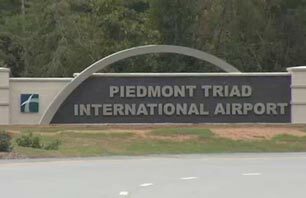 PTI is owned and operated by the Piedmont Triad Airport Authority. No local tax dollars are used to operate PTI Airport. Located at the center of North Carolina and the midpoint of the East Coast, PTI is strategically positioned at the hub of the dynamic Piedmont Triad region, situated between the cities of Greensboro, Winston-Salem and High Point where I-40, I-85 and the future I-73 and I-74 converge. More than 4.5 million people live within a 90-minute drive of PTI Airport. The current passenger terminal facility began operations on October 9, 1982 and has undergone several renovations and expansions. The PTI passenger terminal building contains: 296,000 square feet of area on two public levels; 65,000 square feet on the service level below ground level; 25 aircraft parking positions adjacent to the two concourses; Separate baggage claim and ticket counter areas for each concourse... The airfield facilities include three runways: The main runway 5/23 is 10,001 feet long; The cross-wind runway 14/32 is 6,380 feet long; Parallel Runway 5L/23R 9,000 feet long. To learn more about Piedmont Triad International Airport, click here. Charlotte Douglas International Airport (CLT) serves more than 44 million passengers annually, and received the prestigious Eagle Award in 2010 from the International Air Transport Association (IATA) for “Best Airport.” It is considered the most distinguished of awards in the aviation industry. CLT was recognized for its quality service and economical value to airline customers. The Airport is operated financially on a fully self-sustaining basis – no general fund revenues have ever been or are appropriated to the cost of the facilities or operations. Rather, Airport revenues defray all capital and operating costs including the cost of City of Charlotte, North Carolina furnished services. Airport revenue types include the airfield, terminal area, concessions, parking and the cargo area. This gives CLT Airport its annual operating budget. Over the last 20 years, the presence and growth of Charlotte Douglas International Airport (CLT) and its airline hub has resulted in CLT becoming not only one of the busiest airports in the U.S., but also one of the busiest airports in the entire world. With a forward-thinking philosophy, and a focus on constant growth, CLT sees itself as an Airport of The Future. Charlotte Douglas International Airport is the nation’s 6th largest airport in operations, and 8th busiest in passengers. Its growth has been remarkable, over the last 10 years especially, increasing from 25 million total passengers in 2004, to 44.3 million total passengers in 2014. 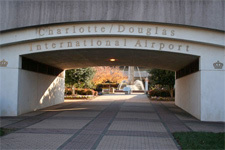 To learn more about Charlotte Douglas International Airport, click here.